As a parent, you want the very best for your child. From their education to the food they eat, every element of development needs to be addressed properly to form a happy, healthy human. One area that causes parents a lot of concern is their child’s oral health. If you’re a Texas resident and you worry about your little one’s smile, our pediatric dentists in Seguin and San Marcos are here and happy to help! Alligator Dental is here to provide a comfortable, fun environment for children of all ages. From our theater room to our fun-filled arcade, our dental clinics are suited to allow your child to have a good time while they develop healthy oral habits that will last a lifetime! Today, we’ll reflect on a few pediatric dental concerns, as well as a couple of new conditions to ensure you achieve peace of mind when caring for your child’s oral health. As always, we’re here anytime to answer questions, so feel free to call us if you need assistance. More commonly referred to as tooth grinding, this condition is common in children under the age of seven. In most cases, kids will grind their teeth while sleeping. It can help to know that your child’s bite will change over the years, and their flexible pattern will not be negatively impacted by bruxism. In most cases, children will begin to stop grinding their teeth at six years of age and stop by the age of 12. Anxiety is a common cause for bruxism in kids as they progress through middle school and high school. This is relatively common, and will normally not be a cause for great concern. Our pediatric dentists will work with you on this issue and keep a close eye on your child’s smile to ensure no further actions are needed. Often referred to as early childhood caries, pediatric dentists often see tooth decay resulting from bottle use. Any liquids that your little one consumes in bottle form (i.e. juice, formula, even breast milk) can cause fast-developing problems when it comes to the health of their smile. The sugary liquids present in such drinks can come into contact with your baby’s teeth, pooling at and eroding the protective enamel surrounding each tooth. Once your baby is old enough, it is highly recommended to fill the bottle with water to avoid the growth of cavities. Adult teeth will begin to erupt around the time baby teeth are falling out. If your child has a permanent tooth coming in behind their primaries, there normally isn’t any need to worry. The front teeth along the lower jaw commonly have this issue, as the adult teeth begin to grow in here first. Normally, the baby teeth will become loose and fall out within a few weeks of the onset of adult teeth. If there is no looseness in your child’s primary teeth, then a tooth extraction may be necessary to ensure the new teeth have room to come in properly. Our pediatric dental team will be able to monitor your little one’s smile closely to see if any further action is needed. Sucking of the thumb is perfectly normal, and most kids will rely on this habit until they are about three years old. If they continue the habit past age four, the front teeth may be impacted. The higher frequency and intensity of sucking will play a major part in how serious the problem is. If your child is continually sucking their thumb, our pediatric dentists will intervene with helpful tips and alternatives to stop the habit. If the problem worsens, our team will be able to provide ideal orthodontic treatments to ensure a healthy smile. 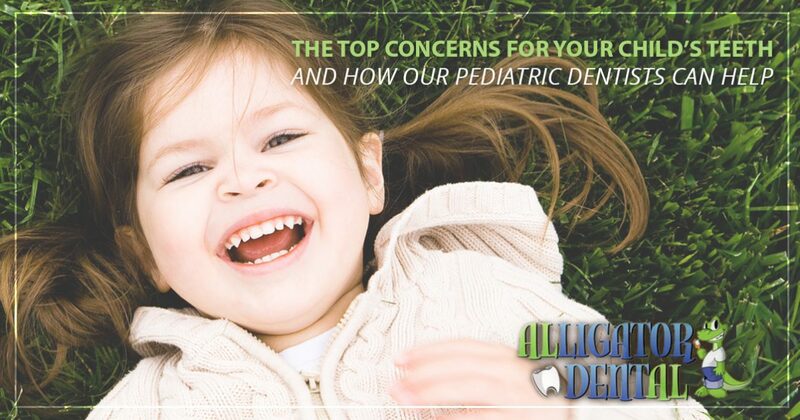 While the other concerns we mentioned are not common, a majority of children have a lot of anxiety when it comes to seeing a pediatric dental specialist. Fear of the dentist is all-too-common for kids, making it essential for parents across Texas to find a dental office that tailors the experience for happy smiles. Achieving a positive dental experience for your child can help to establish a lifetime of healthy oral care habits. If you’re looking for an exciting location to bring your little one to receive Top-Rated Local® dental care, then our pediatric dentists in Seguin and San Marcos are here and ready to help. Contact us today to learn more, and be sure to schedule your first appointment!